This church in Manning was founded in 1869 by a woman, Mary Scott Harvin (known locally as “Aunt Mary”). Like many new churches at that time, the congregation initially met outdoors. In 1881 members purchased a half-acre of land and were able to build this church, described as “enlarged and beautified on a very modern style,” in 1901. Additions were completed in 1912. 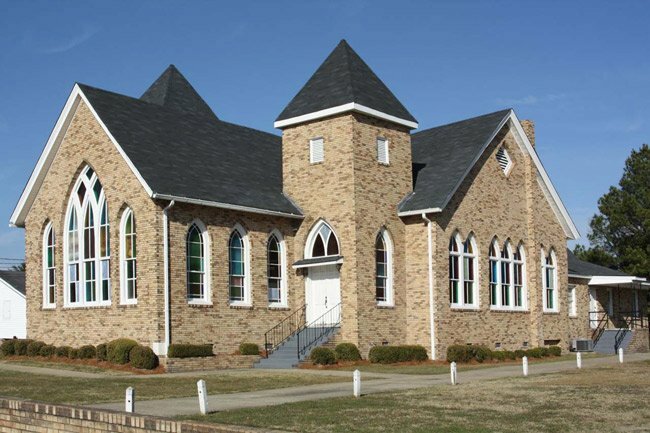 Ebenezer Baptist is also one of several churches in the area that held meetings on desegregation in the mid-twentieth century, along with nearby Liberty Hill AME Church. Several plaintiffs in the 1952 landmark case Briggs versus Elliott, which led to Brown versus the Board of Education two years later, were members of Ebenezer Baptist Church. Even though the verdict of Brown versus the Board of Education was a victory for the plaintiffs after losing their initial case, the results were personally tragic for many of them, as all were fired from their jobs and several were harassed to the point of having their properties burned. Many left town, in need of work and fearing for their safety.